Our guide to The Division 2's Specializations—Sharpshooter, Demolitionist and Survivalist. While it mostly looks similar to its predecessor, The Division 2 makes huge changes to many of the systems from the first game. One of the biggest additions comes in the form of Specializations, a sort of soft character class, to help solidify your role in a team, that brings with it a whole new progression system. Whether it's newcomers starting The Division fresh and wanting to hit the ground running, or veterans who’re more used to how the first game does things, understanding Specializations will be key once you’ve hit the level cap in The Division 2. 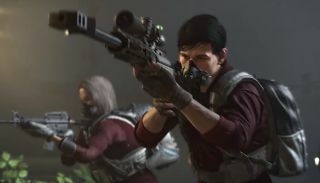 Specializations are one part of the massive new endgame progression system for The Division 2, meaning you’ll have to reach the full endgame before you can take advantage of them. Once you hit level 30, make sure you’ve completed all three of the available Stronghold missions: Roosevelt Island, District Union Arena, and the freshly unlocked Capitol Building. Beating the last of those three will unlock the endgame in its entirety, and prompt you to head to the White House to equip a Specialization at the same desk as where you equip skills and perks. Specializations aren’t permanent choices you’ll have to live with for the rest of your career, so don’t worry about trying each one out to find which one fits you the best. If you’re not gelling with one, return to the desk and simply swap out for a new one at no cost. However, be aware that levelling your Specializations can take a bit of effort, and Specialization points (explained below) don’t transfer between roles. You don’t want to spend too much time with a role you’re not feeling, to ensure you’re getting the right sort of points for the specializations you do like. Each Specialization comes with its own equipment, an exclusive grenade, a signature weapon that trades high power and special abilities with limited ammunition, and a set of unique skills to unlock. While you’re still free to use the rest of your gear freely with any Specialization, each one does confer not-insignificant bonuses to specific types of weapon, which should be something to take into consideration when kitting out your character. Players of Destiny and Destiny 2 may be familiar with how acquiring ammunition for the signature weapons works, as it’s not dissimilar from that game’s Orbs of Light. Each Specialization can more easily affect the enemy in unique ways, and taking advantage of this will generate ammunition: Demolitionists can cause signature ammo to drop through explosive kills, Sharpshooters via headshots, and Survivalists from enemies killed with active status effects. It’s vital you pick up any signature ammo you come across, but it’s highlighted in a dark orange to make spotting when it’s dropped easier. Because of how scarce and rare to drop signature ammo can be, make sure there are a variety of Specializations in your squad, rather than four or eight players all using the same one. Otherwise you’re at risk of cannibalising the team’s opportunities to generate ammo. Ubisoft has spoken little about post-launch Specializations, other than a few will come over the course of the first year. Gaining them seems similar to how Ubisoft’s other major multiplayer game, Rainbow 6 Siege, handles its Operators: VIP players – those who bought the Year 1 Pass, or an edition of the game that includes it bundled in, will unlock these Specializations as they become available. For everyone else, they’ll still be available, but unlocking them may take a fair while if the Rainbow 6 model is anything to go by. There are some prominent character roles that the three known Specializations don’t quite cater for yet, which might give us some idea what the post-launch additions could be. For instance, while the Specialist has some support capabilities, there isn’t a distinct healer Specialization. There also isn’t anything specifically for the Dark Zone, which, considering the game is balancing PvP and PvE as two distinct parts, it’d make sense for there to be one that prioritises it over PvE bonuses. Focused on range, the Sharpshooter’s signature weapon is a powerful TAC-50 C sniper rifle. Different from other sniper rifles in the game, this one can pierce enemy armour, meaning carefully lined-up shots could hit weak spots through an enemy, or even hit other baddies as it passes through them. Hit targets will also give off a burst that will give off a small damaging area of effect, making it good for bunched up groups of enemies. The Sharpshooter is meant to hand back and pick enemies off from a distance. The Sharpshooter Tactical Link skill, which costs 10 points, gives a 10% headshot damage bonus to the entire team, but only if they’re closer to the enemy than you are. Combine this with the One in the Head perk, which can increase your headshot damage by 25% at its max tier (costing 25 points total), and enemies will become very, very vulnerable. The Tactical Link unlocks three more perks that provide more benefits, although these aren’t shared with the rest of the team. My Home is my Castle grants you extra armour while in cover, Round After Round automatically generates marksman rifle and standard rifle ammo after 20 seconds, and Vital Protection reduces your risk of taking a critical hit by 20%. None of these will make you a tank, but they will give you the protected you need to dart to a better vantage point. Unlocking One in the Head, meanwhile, unlocks X-Stat Armor Kit Supplementary, which reduces the healing effect of armour kits by a whopping 50%, but also removes status effects and increases your resistance to them. While that sounds like a double-edged sword, there is also the more much palatable Deft Hands perk and, which greatly increases reload speed, and its follow-on perk Breath Control, which does the same for weapon stability. These two put together makes LMGs and smaller-magazine marksman rifles particularly dangerous, as their high damage output is normally balanced with slow reload times. Add some extra weapon mods and they could be devastating. In a more supportive role, the Sharpshooter’s Tactician perk unlocks a unique scouting drone that locates and identifies enemies to the entire team, like a very mobile pulse ability. This can be upgraded for a longer battery life and a higher amount of HP, making it a very useful tool – particularly in open areas. As far as equipment bonuses go, the Sharpshooter can unlock increased rifle damage and gain a 93R burst-fire pistol as a sidearm. However, it’s difficult to justify the 93R, particularly for its intended use as a point-blank weapon, when sawn-off shotguns provide a much meatier punch and won’t cost you vital points. With a bit of management, the Sharpshooter has the capacity to be a ridiculously powerful Specialization. Not only is the TAC-50 a highly versatile and powerful weapon, the skills that can be unlocked turn some of the slowest and difficult to control weapons in the game into speedy and accurate death machines. Set yourself up, hang back, and your team will be able to practically melt the opposition. Armed with its signature M32A1 Multi-shot Grenade Launcher, the Demolitionist is the ideal class for clearing out fortified positions and helping the team push forward before getting flanked by the enemy. The Demolitionist is generally considered the primary damage-dealing Specialization, and its skills help solidify this role. The Demolitionist Tactical Link gives a 5% increase in damage for any member of the team to any enemy out of cover – which may not sound like a lot, but combined with the M32A1’s knockback ability results in a lot of extra damage being dealt. The Tactical Link has three successive perks, with Vital Protection (the same as the Sharpshooter), Crisis Response which automatically refills all ammo when armour is reduced to 0, and Braced for Impact that ignores explosions once every 60 seconds. As the Crisis Response perk might suggest, the key equipment synergy for the Demolitionist is with the Light Machine Gun. Add the Onslaught perk that increases LMG damage, and the Demolitionist gains an almost unlimited supply of ammo for a very high damage gun. Unload an entire boosted LMG magazine into an enemy for extra damage, take just enough damage yourself to destroy your armour and instantly refill your ammo through Crisis Response, and then return to cover to repeat the whole process again. It sounds risky, but the reward of practically unlimited LMG fire with boosted damage is well worth it. For the times you’re caught out in the open with no ammo while pulling this trick, though, you can also increase the damage SMGs do with the Spray and Pray perk. SMGs have terrible range, but decent damage, making them an ideal secondary weapon for Demolitionists who always need to remain in the enemy’s face. The Demolitionist also has an exclusive Turret skill, the Artillery. While it requires you to manually aim the shots, the artillery can send a barrage of explosive damage from quite a distance. While its ammo supply is limited, this, and the turret’s armour, can also be upgraded through successive perks. The Artillery has decent range and great damage output, although it struggles in enclosed areas such as the garages in the Jefferson Memorial mission. Finally, the Demolitionist has the Explosive Ordnance skill tree. Starting with Explosive Ordnance, which gives three tiers of increasing explosive damage, the successive skills are Incombustible, which increases burn resistance by 20%, Frag Grenades, which cause bleeding to enemies caught in the blast, and its own version of the X-Stat Armor Kit Supplementary, which offers 100% increased weapon handling in exchange for a delayed heal. 70% of armour is repaired straight away, while the other 30% won’t until after the handling boost has worn off. The Demolitionist isn’t a supportive role, it’s the DPS of the squad. It’s about getting in, getting messy, and causing as much destruction as possible before you’re taken down yourself. Because of that, it’s not the best role to play when playing solo, and in a group it’s vital you have a team backing you up. With that being said, the sheer carnage this Specialization can cause makes it highly effective in missions and Strongholds where there are lots of enemies to clear quickly. As the closest thing to a support Specialization, the Survivalist isn’t a damage-dealing powerhouse like the other two roles. Instead, it’s focused on inflicting status effects (burn, dizzy etc.) onto enemies while simultaneously buffing teammates. It’s the closest thing to a support Specialization out of the three currently available, but it still has enough quirks to make it something special. The crossbow works kind of like the halfway point between a grenade and a rifle. Aimed directly at an enemy, the bolts will do a decent amount of damage, but the real use is when aimed at the environment. Once fired, the bolt will create an area of effect that will detonate like a grenade, doing damage and applying bleed status effects to anyone caught in the blast. This can be combined with the Incendiary Grenade perk, which lets your grenades give the burning status effect too, and the Survivalist Tactical Link that gives the team a 10% damage boost against enemies who’re suffering from status effects. The Survivalist is great at spreading damage out over a longer time, which can prove useful for enemies in fortified positions, or those who are retreating. The Survivalist’s real potential is in its supportive skills, though. It’s almost the complete opposite of the Demolitionist: there is very little that benefits the Survivalist directly, but a hell of a lot that benefits teammates. There is a unique version of the Seeker mines, the Mender, that will locate teammates and repair their armour over time. That can be synergised with the Triage Specialist skill, which increases the amount of healing you do, and the Distributed Repair skill. Distributed Repair is the Survivalist’s equivalent to the X-Stat for the Demolitionist and Sharpshooter; armour kits will no longer provide instant heals, but instead will heal both you and any teammate within a 10 metre range over a five-second duration. It’s the Distributed Repair skill that really solidifies the Survivalist’s position of the middle of any fight. With the Sharpshooters at the back and the Demolitionists at the front, the Survivalist can more easily heal and support both from the middle of the pack, while also using the range of the crossbow to help out offensively. The Survivalist’s weapon buffs also cement this mid-field position. E.M.I provides three tiers of improved assault rifle damage, and Running the Gun does the same for shotguns. Best of all, the Scraping By perk provides ammo regeneration for every second you’re moving from cover to cover. Keep mobile, keep in cover, keep causing status effects, and keep healing where you can, and you should never run out of ammo in the middle of a fight. The Survivalist has so far been considered the least viable of the Specializations by the community. However, with Raids and even higher difficulties coming in a future update, it may be worth investing some time into the role, as it’s easy to see how it might suddenly become a highly useful skillset over the coming months. Perks for Specializations don’t cost SHD tech, instead a whole new currency called Specialization Points is used. These can’t be found in the world, instead they’re earned through completing endgame activities. Points come in thick and fast, with everything from recapturing capture points and beating Invaded Missions to completing Strongholds awarding a certain amount of them. That’s helpful, because the cost of perks adds up very quickly, especially for ones with multiple tiers to upgrade to. Fortunately, you can respect your skills for a certain amount of standard credits at any time, for if you’ve not distributed your points in the best way. Importantly, you only gain Specialization Points for the Specialization you have active at that time. Points earned while playing as a Survivalist can’t then be used for the Demolitionist, meaning if you want a full armoury and completely kitted out specializations, you’re going to have to sink some time into playing all three roles. Still, it’s surprising how generous The Division 2 is with giving out these points. Specializations form the backbone of endgame progression, yet fully unlocking each one doesn’t take too much time or effort to do. Whether you’re a reckless damage-dealer, a precise sniper, or more of a healer, the Division 2’s Specializations let you fine-tune your character to the exact role you want it to be. The amount of perks, and the numbers attached to them, can be overwhelming, but with a bit of time and planning, it can set you up for the challenges DC has to offer.